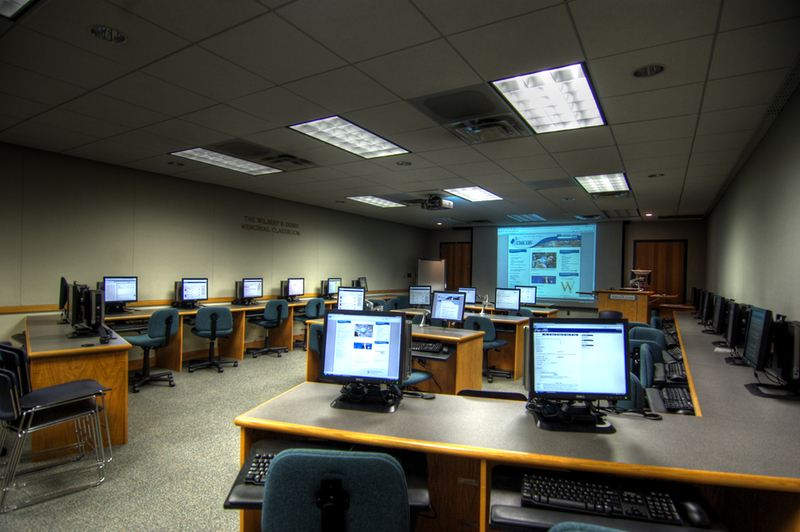 The Wilbert B. Dubin Memorial Classroom (located on first floor of Lauinger Library) is intended primarily for use as a library research instruction classroom. We teach library research instruction classes designed to introduce students to the Library's collections, services and research tools. In addition to library research instruction, librarians are happy to team teach classes with faculty who will make use of the resources available. We encourage faculty to take advantage of this classroom to integrate library resources and research skills into their courses. To reserve the Dubin Memorial Classroom, please fill out and submit the Dubin classroom use request form. To schedule a library instruction session for your class, please fill out and submit this online form. Non-library classes may be scheduled on a one-time, irregular basis if the Dubin Classroom is not scheduled for a priority function. Any library use receives priority over non-library use. Faculty and staff requesting use of the room will be informed at least four business days prior to the class/meeting date if they can be accommodated. Classes are scheduled on a first-come, first-served basis, with priority for library research instruction sessions. Computers in Dubin Memorial Classroom have the same software installed as the computers in the Gelardin Open Computing Area. Please note that the Library Information Technology Department needs to approve any additional software installations. Software requests must be made four weeks in advance.